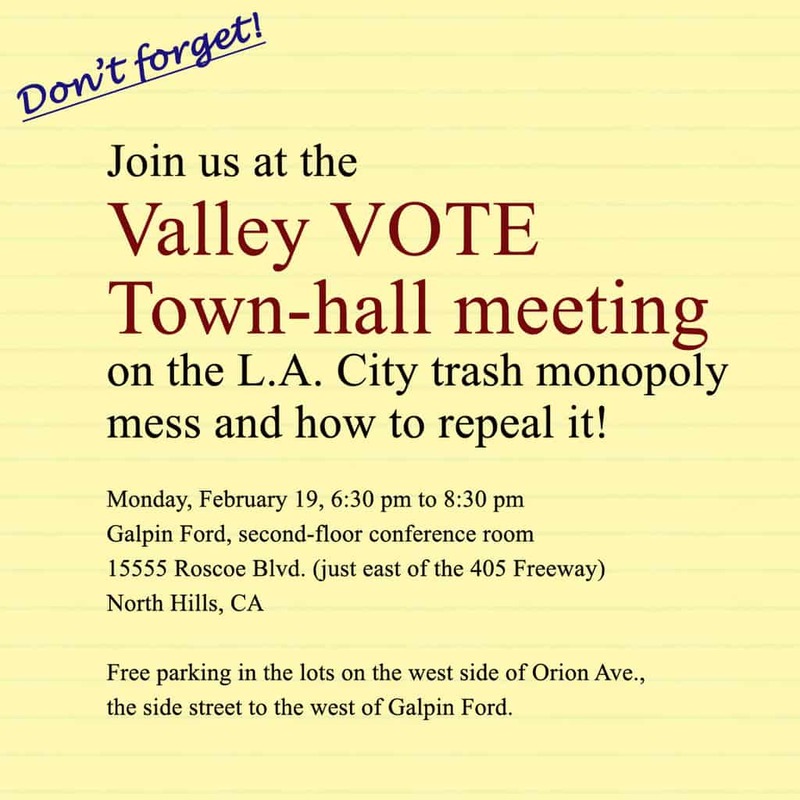 Hope to see you Monday night at the Valley VOTE meeting! The Executive Committee of Valley VOTE, a diverse coalition of San Fernando Valley residents, businesses and civic organizations, urges the people of Los Angeles to vote in favor of Measure S, the Neighborhood Integrity Initiative, on the March 7 ballot. Only by approving Measure S can ordinary citizens of Los Angeles take back control of their neighborhoods from property developers who collude with city politicians to build massive projects out of scale with their surroundings. Measure S will implement a two-year moratorium on mega-construction projects that create traffic, displace longtime residents and destroy neighborhoods. The two years would be used to update residential and commercial zoning plans that are decades out of date. Mayor Eric Garcetti and the city council have used obsolete zoning as an excuse to grant exemptions and variances on an ad hoc basis. This “pay to play” decision making, otherwise known as “spot zoning,” enriches politicians and developers while leaving citizens living in the shadow of luxury high-rises and searching in vain for a place to park. Measure S mandates several needed reforms. Right now developers can ignore the disruption their projects cause by writing their own Environmental Impact Reports. Measure S requires that independent experts assess potential traffic and environmental degradation and the assessments be paid for by the developers themselves. Prior to the start of construction, developers will have to show that their projects do not burden the community with parking and traffic gridlock. Today, developers make cash donations to city politicians who then agree not to enforce existing regulations. According to LA Ethics Commission filings, lobbyists were paid a staggering $44.7 million in the first three quarters of 2016 to influence elected officials behind closed doors. Measure S would force meetings into the open and insist the city council follow a publicly agreed upon General Plan. Property developers are waging a campaign of disinformation. They say the initiative will prevent the city from building affordable housing. This is not true. Measure S has no negative effect on affordable housing. Indeed, it will prevent affordable units from being destroyed as they often are today when condo towers are built. Developers insist a pause in massive development will cost jobs. This is unlikely since City Hall already has said the recently passed $120 million in mass transit improvements will create 465,000 new jobs. Valley VOTE believes healthy cities are growing cities. We anticipate high-rise development around metro stations and along some commercial thoroughfares. But development should occur within the scope of agreed-upon zoning. Measure S provides the opportunity for city officials and neighborhood leaders to mutually decide what is right for their communities. The Executive Committee of Valley VOTE opposes the proposed five-year increase in LADWP water and power rates and calls for a continuation of the salary freeze that is set to expire in 2016. The “Benchmarking Analysis” produced in February by LADWP’s Corporate Performance Division with the help of two outside consultants reveals that LADWP spends more money on payroll, measured by total payroll dollars per customer, than more than 75 percent of comparable utilities. LADWP also spends more on pension and health benefits than other utilities. The CPC’s analysis makes clear the DWP’s primary motivation in setting employee compensation is political in nature–specifically to accommodate the union and its members at the expense of ratepayers. Particularly alarming is that, as an unregulated monopoly, the DWP is able to pass increased payroll costs to its 4 million customers through higher rates and charges for the essential services of water and power. Consequently, millions of Los Angeles residents are being forced to subsidize lavish compensation packages that dwarf their own incomes. Also pointed out in the report by author Robert Fellner is that LADWP made national headlines in 2012 and 2013 when Bloomberg reported LADWP garage attendants were making nearly four times the national average. The Los Angeles Times found that the average pay for DWP employees was over $100,000 in 2012, approximately 50% higher than other city employees. Bond ratings analysts at Moody’s, Fitch and Standard & Poor’s have reassured investors that while the process for raising base rates is slow, the presence of “cost adjustment mechanisms” enables LADWP to add extra charges to its customers’ bills. from the California State treasurer, and LADWP’s benchmarking analysis found that its debt ratio is far worse than comparable utilities. This is related to the indefensible transfer, every year, of 8 percent of the power system’s gross revenue for the previous year to the L.A. City treasury. The city received ratepayer funds of $247 million in 2013, $253 million in 2014, and $266 million in 2015. Standard & Poor’s projects that by 2020 the city transfer will be more than $320 million. The annual transfer equals or exceeds the $270 million in annual revenue that would be raised by the proposed five-year rate increase. Without the city transfer, the rate increase would not be needed. Although L.A.’s city charter allows the transfer of surplus revenue, no reasonable person could conclude that LADWP has even one dollar of surplus revenue, not while it is pursuing rate increases and additional bond sales of billions of dollars. The city transfer may be illegal. It has been challenged in three lawsuits, recently consolidated into one case and set for trial. Valley VOTE calls on Mayor Eric Garcetti and the City Council to oppose the DWP’s rate hikes, upcoming salary raises and transfers of “surplus” funds. The city transfer should be halted until the legal challenge is resolved. LADWP salaries should be frozen until a full examination of labor and benefit costs, a study recommended in the benchmarking analysis, is completed and made public. Therefore be it resolved that the Foundation for Pierce College requests that the LACCD Board of trustees ask the Chancellor to utilize the resources needed, internal and external, to develop a feasibility study of the “Permanent Agricultural Protected Land” status options available to the Pierce Farm, including any potential easements, conservancy status, or any other legal options for guaranteeing the permanent protection of this portion of the Pierce College property. Such study shall be completed and reported back to the Board of Trustees no later than September 1, 2015. “Valley on Track” is dedicated to improving upon the regions most pressing transportation issues and opportunities so that our ground mobility can be optimized to enhance the business climate, public health and quality of life for San Fernando Valley residents. The Valley has been severally under served by rail transportation for years. There are only two rail transit stations in the Valley. They represent 2.5% of all of the stations in L.A County, while the Valley represents 20% of the L.A. County population. Future rail transit plans must include projects that focus on the critical needs of the Valley. 1. Upgrade the Metro Orange Line busway to light rail. A victim of its own huge success, growing rider ship has made the line overcrowded and slow. Conversion to light rail is the best choice now to improve what has become the Valley’s transit backbone. The line is an existing 18-mile east-west busway running parallel to the 101 freeway from North Hollywood to Chatsworth along Chandler and Victory Boulevards and Canoga Avenue. Completion Date: To be determined. The route runs through some of the most transit dependent, majority minority communities in L.A. County. Current bus lines along the corridor are the most heavily used in the Valley after the Orange Line and among the top ten in the county. The Valley cannot accept another under built project that does not meet the demand. Currently in the planning stage, the corridor will run north-south between Sylmar and Van Nuys, and will eventually connect with the Sepulveda Pass Corridor. Completion Date: 2018, under current Measure R projection. Connecting the Valley to the Westside, the Sepulveda Pass is one of the world’s most congested traffic corridors. No mode besides rail can even begin to address the transit demand. Currently the last project in Measure R, the corridor will run from Sherman Oaks to the Westside. It should serve UCLA and West L.A. Metro lines, with the potential to eventually reach LAX. 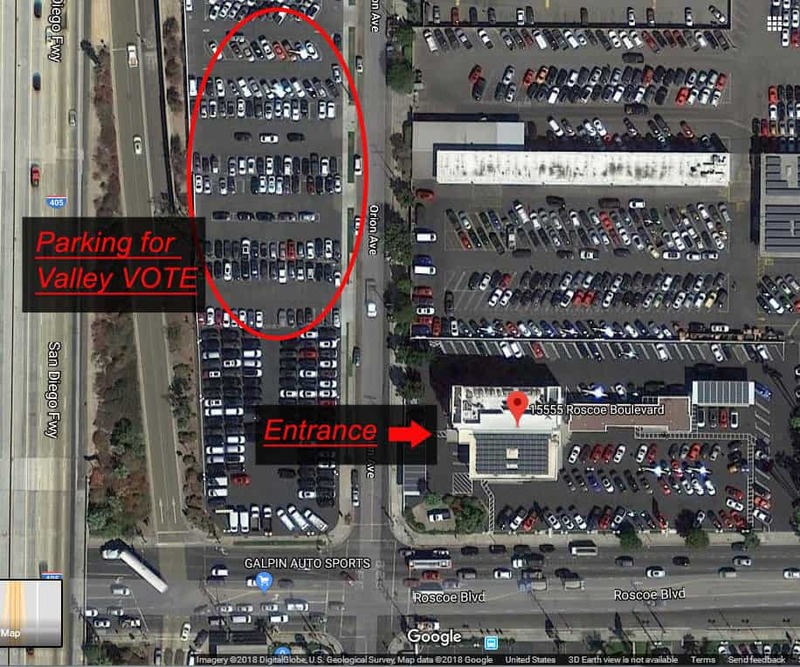 Valley VOTE supports the Class Action Lawsuit filed on June 7, 2011 on behalf of four plaintiffs. The first is Carolina Winston Barrie, a great granddaughter of one of the land donors in 1888 that bequeathed the property, in perpetuity, in West Los Angeles exclusively for America’s Military Veterans. The other three are veterans plaintiffs; one from the Iraq war, one from the Afghanistan conflict, and one a sexually abused woman veteran. The ACLU foundation of Southern California and six law firms; Harvard Law School, UCLA Law School Inner City Law Center, Munger,Tolles &Olsen LLP, Arnold &Porter LLP and additional counsel (7) are in support of this suit. It was filed vs. Erick Shinseki in his official capacity, Department of Veterans Affairs; and Donna M. Beiter, in her official capacity, Director, VA Greater Los Angeles Healthcare System. 1) Intentional discrimination, all plaintiffs and Vietnam Veterans of America. Valley VOTE, a diverse coalition of San Fernando Valley residents, businesspeople, educators, community activists, and organizations, is committed to exploring and fostering the implementation of programs that empower the people of the San Fernando Valley and the City of Los Angeles, to improve local governance, education and public participation on policy matters.